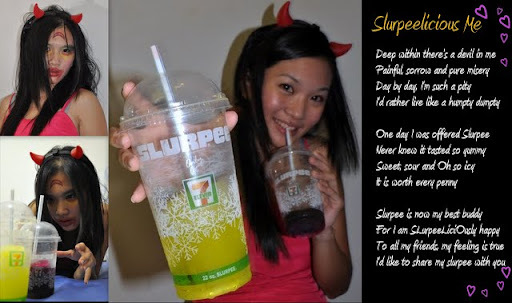 MSXEROZ:::Stories of My Life:::: Slurpee Slurpeelicious Moments Contest Voting Starts Now~!! Slurpee Slurpeelicious Moments Contest Voting Starts Now~!! Miracle Lady MsXeRoZ performs magic again. It was a hectic hectic week!!! a) I am Nescafe Chill-Lah Contest top 20 finalist, i have to make a video of my script by 2nd November. b) I am Sunsilk Great Hair Moments Contest top 6 finalist. I have to attend the party(like beauty contest) on 24th at Zouk! Had to go to Damansara to get the sponsored outfit. a) XeRoZ's parents suddenly buy him a car and he doesnt know what he wants and how to decide. c) Preparation for Sunsilk Competition Script! I havent decide on my hair-do -.-!!! d) Preparation for Nescafe video!! I had an idea, but i dont have manpower realise my imagination! Therefore, i'm hoping my blog readers and blogger friends, can help me release some burden. Help me vote in my Slurpee Competition~!! Pleaaaaaaaaaaaaseeee~!!~!! 4. Enter your email address..
7. verify the 5 votes you have submited! Alright~! 8 Simple Steps you can repeat everyday. I love you very mucccchhhh~!! So much going on in a week, have heaps to blog about yea? Mizzsharon, aww..dont say that about yourself. It's my first time being so busy. Usually i'm too free that i'd join heaps of competition..
Tuesday the 13th, A Curse or Blessing?